Vertical kinetics, monumental video and sound, transparency and user accessibility – all combined with the Festhalle’s impressive architecture. A vision previously unseen and one to remember in the future. 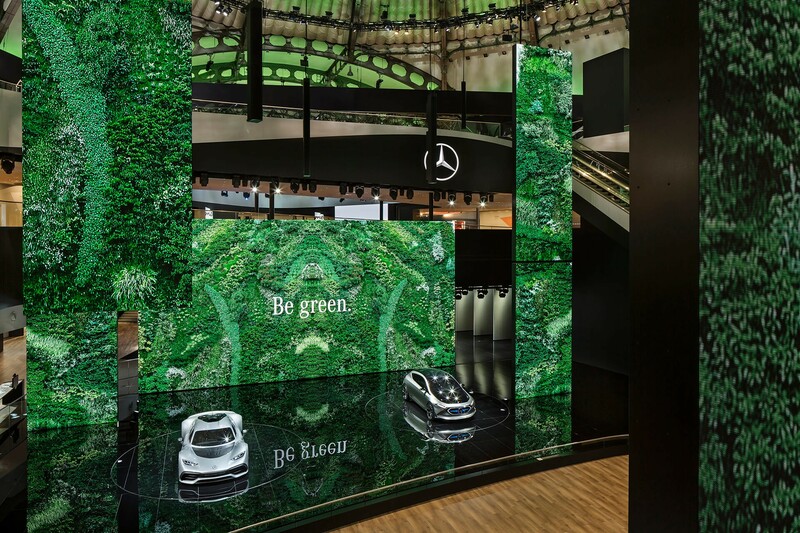 After the great success of the IAA 2015 live show, we had once again the chance to develop in cooperation with Atelier Markgraph this year’s media design, sound concept and most of the film assets for the Mercedes-Benz appearance in Frankfurt. Other than in 2015, the stage concept featured a very much more transparent and accessible architecture, incorporating massive kinetic LED columns that could be moved vertically through the space. and of course, the car performances. 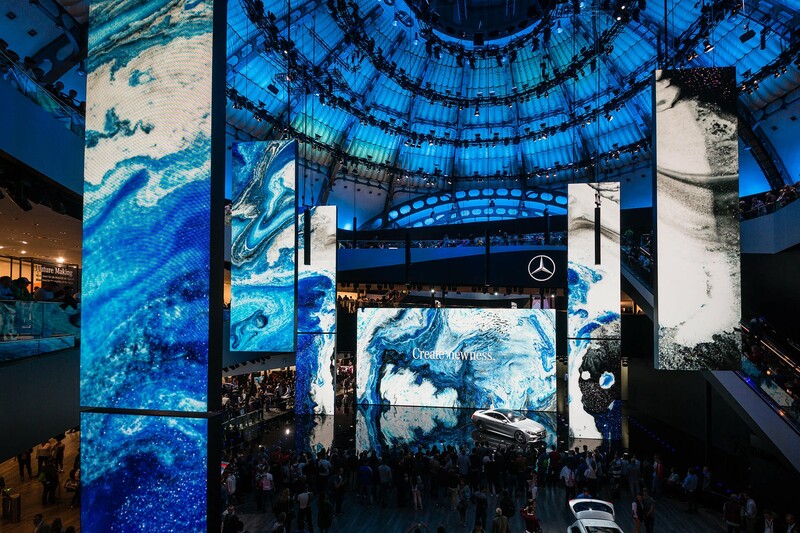 The main chapters were formed by the world premiere of AMG’s hypercar ‘ProjectOne’, which we brought to life as a powerful, photo realistic, full-CGI spot throughout all media surfaces. 50 years of AMG history. We also created a world premiere show for the EQ A prototype presentation, as well as the full EQ product portfolio. Moreover, we produced three live moderation shows in which several future mobility visions were presented and discussed. In between the main show parts, the stage evolved into several ambient spaces, which let the audience immerse itself in futuristic, sustainable, urban environments; as well as an off-topic art installation entitled ‘Art Space’. Of course, all soundtracks and sound FX were written and produced by us as well. For the AMG chapter we built up the tension and emphasized speed by choosing a dramatic and punchy sound. For the EQ A chapter, we composed an energetic pop song called `Electrified` where, working with the singer Jeanne Kaiser, we provided genuine pop appeal. For the Ambient Spaces, we chose a more experimental approach using vocals as an instrument in order to create textures, which we then mixed with atmospheric soundscapes and organic sound design.